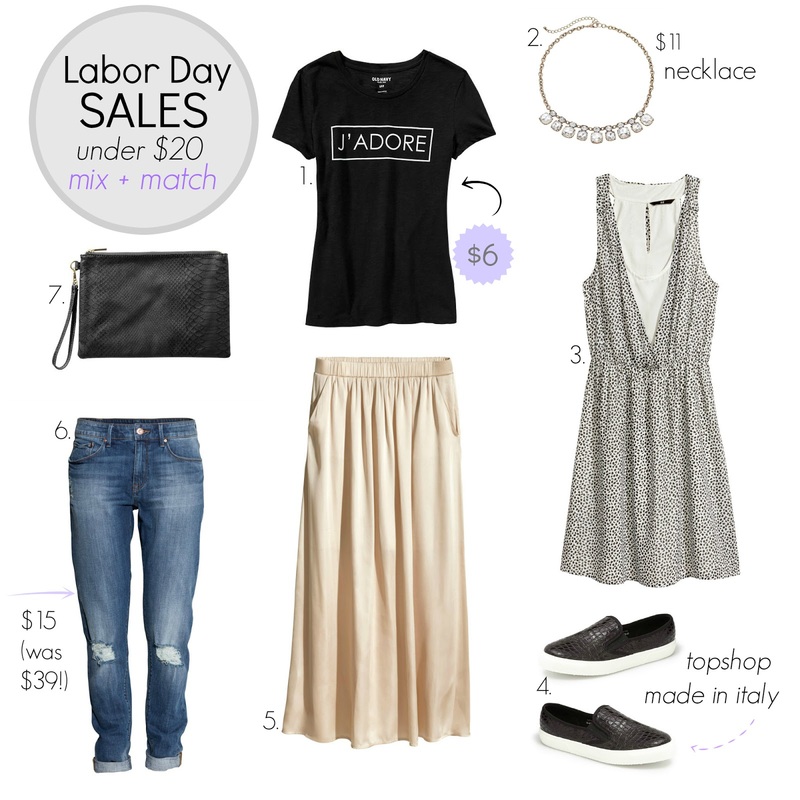 Labor Day Sales + under $20 mix and match picks! Labor Day is the perfect way to end the summer with major end of the season season clearance deals and savings on new fall items, the best of both worlds. My top three stores to stretch your fashion dollars are H&M, Old Navy, and Nordstrom for all the designer markdowns on items you would never see on sale this time of year. I'll be updating the list throughout the shopping weekend. What are you shopping for this weekend? Since I've been working retail these last few months, I haven't had the time to share everything I've wanted to with you on the blog. That will soon change in less than two weeks and I can't wait to get back to blogging on a more regular basis. Looking forward to fall shopping, Target's designer collaboration with Altuzarra, and so much more! 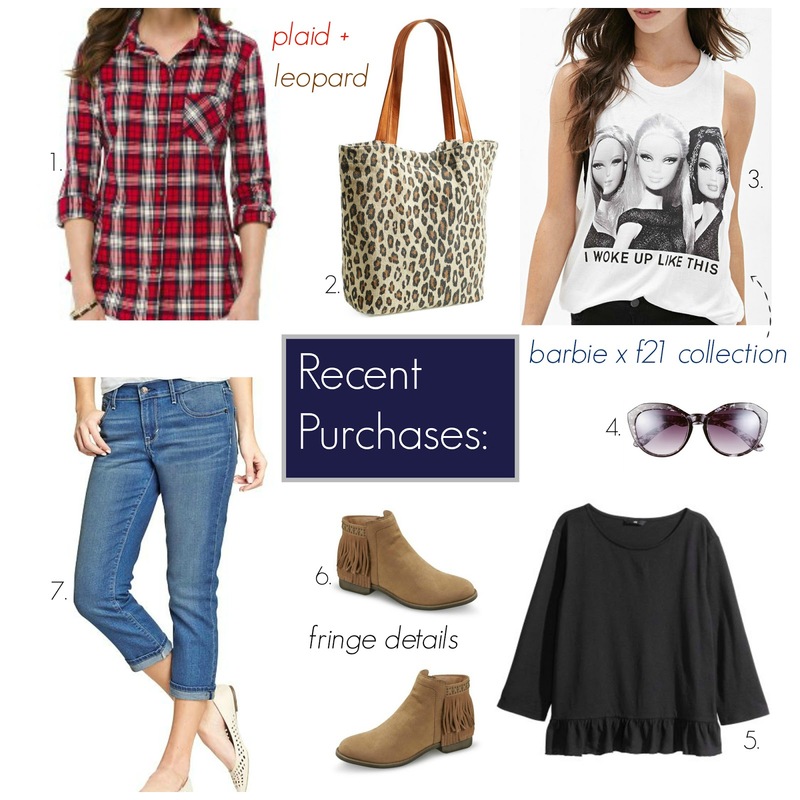 Here are some of my recent purchases and maybe give you a little outfit inspo for a casual day out. This week's favorites has a definite feel for fall, with darker neutrals leading the way and one summer to fall transitional piece in the mix. I am so excited for cooler temps and cozy sweaters to fill the racks, even though I know the weather here in Los Angeles won't dip below 80 degrees for a while. Are you shopping for fall yet? 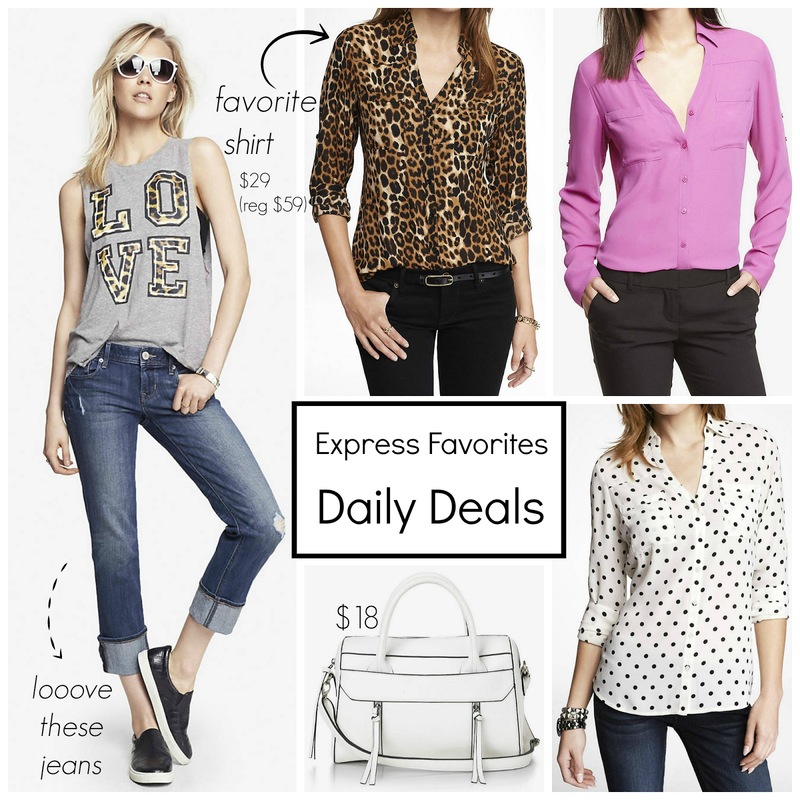 My favorite shirt from Express is on sale today for $29 and while that may not seem like an amazing deal, the portofino shirts rarely go on sale for half-off (most of the time they are buy one, get one at 50% off) and they fit so well. Naturally I added the leopard print to my wardrobe and also picked up the jeans, since those are also hard to find at this price. So many colors and prints to choose from, if you haven't picked one up yet, make sure to stop by or order online. While labor day is just around the corner, this white bag is still super chic! *Take an extra 40% off clearance prices - discount taken at checkout. Friday Favorites: Uptown Girl under $30! This edition of Friday favorites focuses on finding upscale looking pieces at affordable prices. It's all in the details when choosing pieces that are easy on your wallet, but high on style. Faux leather trim is one of my favorite fall items to buy and Banana Republic has a few to choose from on sale this weekend! I also love patent leather shoes and bags, that extra shine literally gives your outfit a perfectly polished appearance. Altuzarra x Target Lookbook is here!! The Altuzarra for Target lookbook is here! The hotly anticipated next designer collaboration for the affordable retailer has fashionistas swooning. This is high fashion to the tenth degree and while my lifestyle doesn't lend itself to all the looks, I'm loving the beautiful silhouettes, snakeskin prints and the overall style. With 50 pieces to choose from (including those gorgeous shoes!) and prices starting at just $17.99, this will be a collection worth staying up late for...or waking up early to hit the stores. Personally, I'll be doing both and sharing all the pictures and info on September 14 when it launches online and in-store on Target and Net-A-Porter. Seeing the new arrivals spotlighting black and white collections are a way to transition shoppers out of the bright summer colors and into classics before hitting you with darker hues all at once. Trending right now are feminine details, pearls and pale pink once again being shown with fall colors. I'm always happy to add a bit of Audrey Hepburn style into my wardrobe, she's an icon for a reason. Oh, and in case you weren't able to track down a chic midi skirt, H&M just received a fresh shipment both in store and online. H&M is still one of my favorite online stores for style inspiration. 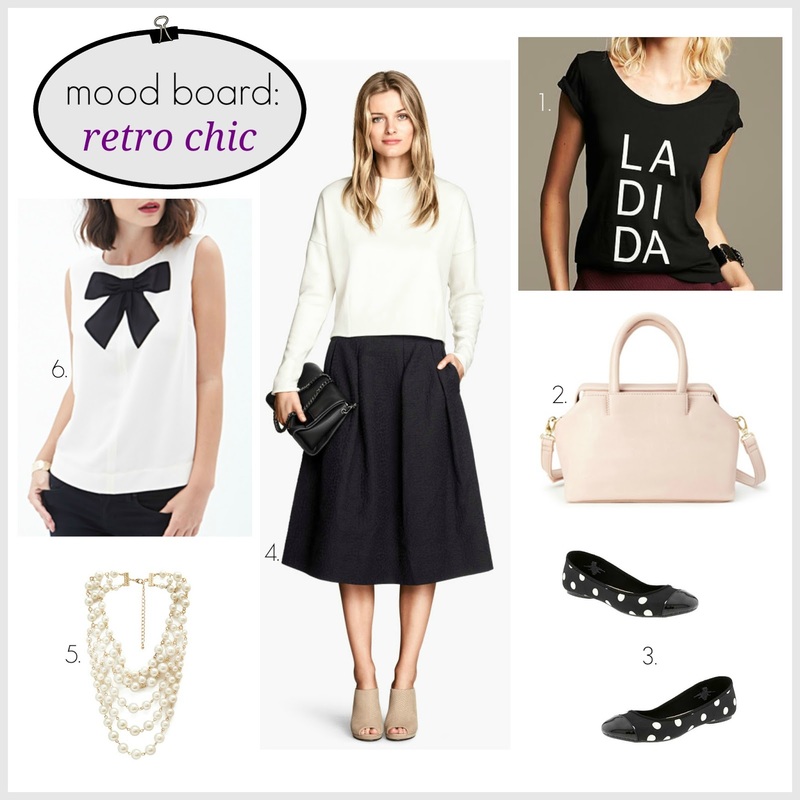 Do you like a bit of retro chic to your look? As many of you already know from following me on Facebook, I am a bit Parisian obsessed. It doesn't help that every store I step foot in has French-inspired statement tees, sweaters, pouches or hats. There's just something about effortless Parisian chic style that makes me swoon. So with this new crop of arrivals, my inner French girl will be strolling down the aisles wearing stripes and red lipstick with coffee in hand of course. Do you like the French statements as much as I do?